Holi is my favourite time of the year, bhaang and water balloon fights aside; Holi is the first, big *FUN* long weekend after New Year's Eve. This is one festival that appeals to people of all age groups. Pool parties, white kurtas, lots of colour and bhaang makes for the IDEAL stress-busting Fri-YAY! If you're looking to have a rather quiet, clean Holi this time around, add some colour to your peepers. We've rummaged through the slew of nail art ideas on the Internet and found you 9 amazing nail designs you can rock, no matter what your style is. 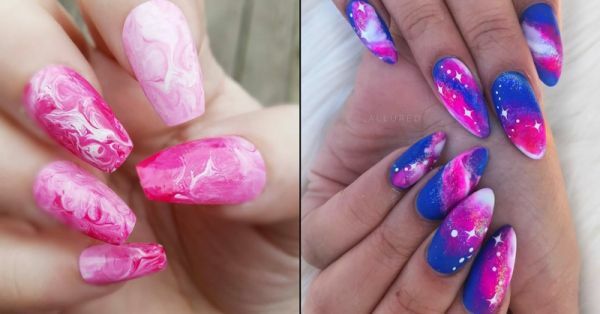 These stunning swirl nails should be your top pick if you're into pink! There's no better way to rock the Pantone colour of the year 2018, right? Can't make up your mind? This nail art design has a little bit of everything! Pastels, ombre, roses and bold lips! These colourful tips will give your post Holi hangover an upgrade! Doesn't this look exactly like your white T-shirt post-Holi? A little bit of sunshine on a rainy day? This rainbow inspired nail art could totally give your mani the upgrade it needs. What's better than black nail polish? Matte black nail polish! If you're not into colourful nails, this matte blue manicure with just a little touch of holographic is perfect for you! Go all out with a holographic manicure, not that this one needed a specific occasion. We bet you won't be able to stop and admire your nails every time you catch some sunlight! Which one of these designs would you choose to wear?